Inception is an 8 piece all male group, residing in Nashville, Tennessee. The group was formed in 1970 and they don’t plan on slowing down. Not only does inception have play-lists from different eras, they also perform numerous musical categories. These range from authentic Big Band, Motown, Carolina Beach Music, R&B, Rock & Roll, Country, Funk, & Jazz. Their style is equally versatile ranging from an acapella vocal group, a choreographed Motown show, to a rhythm section or a combination of all. For those who do not want to dance but want entertainment, Inception can deliver. Those musical impersonations include The Supremes, Elvis, Clarence Carter, & James Brown. 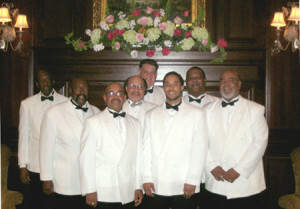 The groups lead singer is the former lead singer with the Spidells, a Coral recording artist. Inception has a 3 piece horn section, which includes Sax/ Flute, Trombone/ Trumpet, & Trumpet/ French Horn. Choreography, audience participation, & professionalism are the cornerstones of Inception. Equipped with a new $80,000.00 bus, they are ready to make your event an evening no one will forget.